SuperPatriot is shocked to see that Mighty Man has transformed into the form of Ann Stevens whom he recognizes from caring for him and then Dragon in Hillman Hospital. Absorbing Junior still possesses residual energies from Mighty Man and moves to finish off SuperPatriot. Ann jumps onto him and makes contact with the villain’s hand meaning that he absorbs her properties instead. She is then able to knock him out with a simple piece of debris. With their opponent left for the authorities, the heroes head back to Freak Force’s headquarters where Ann begins to recite her origin to her teammates and Chelsea Nirvana. She had been present when the original Mighty Man host Robert Berman was brought into Hillman Hospital. His secret identity had been released by the Chicago Voice newspaper and young toughs then beat and stabbed him. Ann stayed by Berman’s side throughout his stay, praying that he would somehow recover. When Robert Berman finally succumbed to his injuries, he called out for his grandson but he was not present and so Ann pretended to be him, holding his hand while Robert passes away. Ann was sent flying back by an energy transfer before Billy Berman arrived, enraged by his grandfather’s death as he had wanted to inherit the abilities of Mighty Man. Ann went home and when she spilled milk over the kitchen floor; she started to clean up the mess. Her phone rang and when she rushed to answer it, Ann slipped on the milk and her wrists slammed together and turned her into Mighty Man. Ann spent days trapped in her new form and felt herself weakening as she was permanently hungry despite eating regularly. She eventually recreated the events that led to her transformation and figures out how to move back and forth between her ordinary form and that of Mighty Man. Ann quickly realized that she must eat in her mortal form for both Mighty Man and her to live. She finishes her story and Dart takes her away for some urgent combat training. It is noted by Rapture that she had hoped to ask Mighty Man questions as he tied into her own origin somewhat. When Barbaric makes an insensitive comment, she opts not to share her own story. Horridus follows her and she talks about how Dr. Nirvana once hired her when she was a prostitute. He was searching for a means to gain superhuman powers and used Rapture as a test subject. The procedure backfired and left Dr. Nirvana comatose and also imbued Rapture with her abilities. This story is secretly listened to by Chelsea who is upset by news of yet another failure of her father. Phyllis Deeder meets up with Mighty Man and checks up on how he is coping with his secret being revealed to everyone. She had been the first person to be told by Ann of her secret and had started calling her “Sam” as her middle name is Samantha. 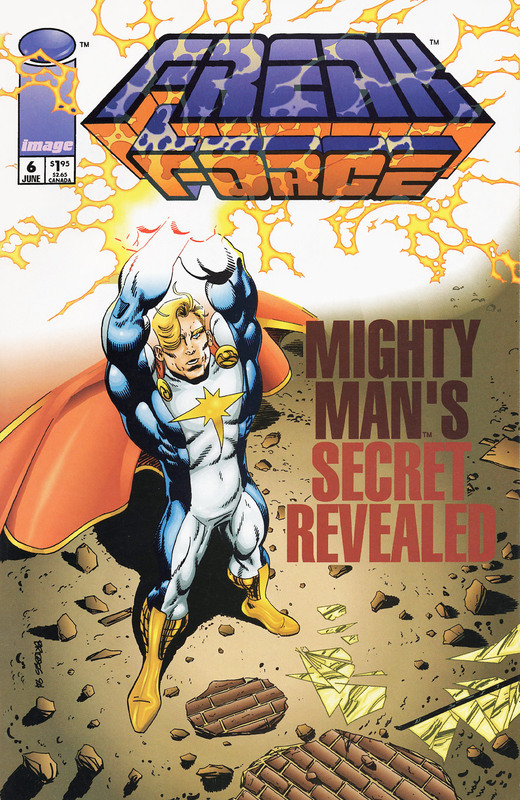 Mighty Man is pleased that he has been accepted in his role by the rest of Freak Force and is here to stay. Dragon later laughs off claims that Absorbing Junior will escape and finally face him in combat.